‘Wine is not a natural product, but vinegar is,” said Professor I. Pretorius, the Scientific Director of the Australian Wine Research Institute at a recent wine microbiology symposium. This reminds us of two elemental facts. First, wine is the complex result of microorganisms interacting with their environment. Second, the control of this process by the winemaker helps assure that wine can be enjoyed on a global scale. Though the wine and grape matrix is often described as providing a difficult environment for the growth and survival of microorganisms, a specific and very distinct group of microorganisms is essential to the production of high-quality wines. The yeast Saccharomyces is one of those organisms. Its ability to proliferate and implant into the matrix changes grape must into wine. Due to the consistency of performance, Saccharomyces cerevisiae is generally the organism of choice to complete the alcoholic fermentation process. Enological strains of Saccharomyces spp. have been available in the active dried form for more than 40 years. Great strides have been made from a technological viewpoint. Due to the natural diversity that has brought us to where we are today, we can separate enological yeast strains into two groups: primary strains and specialty (or technological) strains. Primary strains such as EC-1118â„¢ and BCâ„¢ can complete alcoholic fermentation with minimal sensory deviations. Specialty strains such as RC212®, QA23â„¢, and ICV D-254â„¢ have supplemental abilities in addition to their secure fermentation performances, which may include the revelation of varietal aromas, production of fermentation aromas, action on the wine texture via the production of polysaccharides, or the stabilization of color (via polyphenolic-polysaccharide interactions). Irrespective of strain choice, however, it is imperative that good fermentation practices are followed. This includes applying appropriate nutritional strategies and controlling the fermentation temperature (thereby minimizing the production of undesirable yeast metabolites). Choosing a yeast strain for a successful fermentation includes knowing some basic parameters about your grape must and extrapolating details about the resulting wine (potential alcohol). This initial decision of whether the yeast strain can withstand the alcohol that is to be produced is important, as are the temperature constraints of the yeast strain, its nutritional requirements, lag phase length, competition with other organisms, and rehydration specifics. 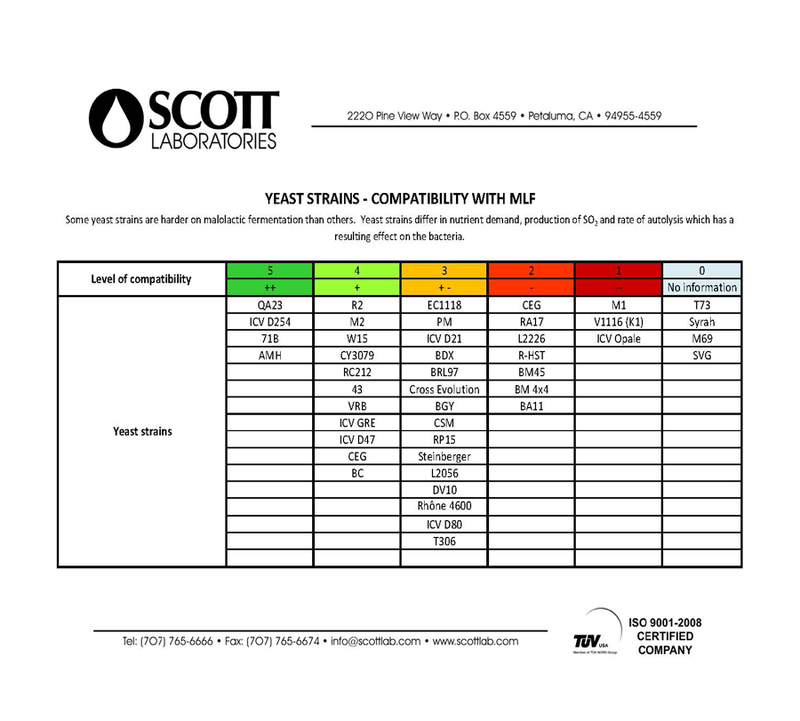 It is also important to determine whether this yeast strain promotes a healthy malolactic fermentation. Malolactic fermentation (MLF) is the conversion of L-malic acid to L-lactic acid by lactic acid bacteria, namely Oenococcus oeni. Strains of Lactobacillus plantarum (V22â„¢), however, are also available for this conversion in high pH situations (above pH 3.5, with no volatile acidity increase from grape sugar metabolism). The topic of malolactic fermentation always leads to lengthy conversations due to the different formulations available (direct addition, 1-step preparations, or standard build-up cultures), different inoculation protocols, and yeast strain compatibility with ML bacteria. The conditions for success, although well documented and understood by winemakers, can still result in problems. These parameters must be viewed in combination (such as SO2 and pH) and not individually (SO2 or pH). A recent focus has been on the isolation of strains with wider environmental limits. It is now possible to successfully achieve MLF in wines in excess of 16% alcohol. In addition to attempting to predict the success of MLF using the aforementioned parameters (alcohol, pH, SO2 concentration, temperature), we must also consider the initial malic acid level, the polyphenolics content, and the organism(s) that may be present and their metabolites. The relationships known to exist between S.cerevisiae and O.oeni include amensalism, predation, commensalism, mutualism, and protocol-operation.2 Put more simply, the relationships can be described as inhibitory, stimulatory, or neutral. Ethanol was the first yeast metabolite reported as being antagonistic toward O. oeni. It is generally accepted that average ethanol levels in table wines are increasing. Thus ethanol tolerance is an important consideration when selecting a bacteria strain. Ethanol affects the growth of the bacteria, but not malic degradation. Malic degradation, however, will not begin until the yeast cell population reaches 1×106 cells/mL. Inoculation rates must be respected for a rapid start. Addition of sulfur dioxide is an integral part of current winemaking practices. O.oeni is more sensitive to the anti-microbial effects of SO2 than other lactic acid bacteria (Lactobacillus spp. and Pediococcus spp) or yeast. It is not always recognized that S.cerevisiae can produce significant amounts of SO2 on its own. This was initially discovered by Fornachon (1968). The amount of SO2 produced is highly dependent upon the strain of yeast and composition of the medium. Yeast strains are classed as low, medium, or high SO2 producers. The amount of SO2 produced can range from ~20 ppm to in excess of 90 ppm. It is essential to know the SO2 levels (both free and total) in a wine. Fatty acids can be produced by yeast. Their production is dependent upon the must composition, grape cultivar, yeast strain, fermentation temperature, and winemaking practices. Short and medium chain fatty acids (hexanoic, octanoic, and decanoic acid) are reported to inhibit bacteria and yeast. These acids can target and alter the bacterial membrane, resulting in limited growth and reduced ability of the bacteria to degrade the malic acid (Table I). It has also been demonstrated that fatty acids work in synergy with ethanol and pH, resulting in even more challenging conditions. On a positive note, it is possible to remove fatty acids via adsorption by yeast ghosts (hulls). A number of yeast-derived metabolites can exert an inhibitory effect on ML bacteria. Some can be measured (ethanol and SO2), while others are more challenging to assess (fatty acids). Not all malolactic fermentation inhibition can be attributed to the production of yeast-based metabolites. During alcoholic fermentation the microflora present can utilize macro and micronutrients. This may result in a nutrient-depleted environment for the fastidious O.oeni. From a nutritional standpoint, Oenococcus spp. require amino acids, as they do not have the ability to assimilate ammonium salts. The individual amino acids that the bacteria require vary depending on the strain. Using knock-out studies, it has been observed that some strains require as many as 13 of the 20 amino acids7 . These amino acids are deemed to be essential, and others may be necessary as well. If they are not present, growth cannot occur. In addition to amino acids, it is essential that wine bacteria are supplied with peptides, vitamins (biotin, thiamine, nicotinic acid, and pantothenic acid), and minerals (manganese, potassium, and magnesium). Since we have no practical means of determining amino acid deficiencies for bacteria, we may not be aware that the bacteria are encountering a nutritionally-depleted environment. We can, however, ‘guestimate” if we know both the yeast assimilable nitrogen concentration at the beginning of the alcoholic fermentation plus the specific nitrogen requirements of the wine yeast used. In certain situations during the alcoholic fermentation, the presence of O.oeni can have a negative effect on S.cerevisiae. Some bacteria have the ability to utilize the grape sugars and produce acetic acid. It has been speculated that acetic acid alone may not be antagonistic, but when in combination with other metabolites, it can lead to an accelerated death of wine yeast. Not only negative interactions can occur. S.cerevisiae can stimulate the growth of O.oeni. This stimulation is thought to be related to the yeast autolysis rate. It is during yeast autolysis that the nutritional composition of the matrix is altered, favoring the release of mannoproteins and amino acids. The released mannoproteins have a dual function. They can detoxify the medium and protect the cells from potential polyphenolic inhibition. Mannoproteins may have an additional role in enhancing the nutritional content of the wine. This is possibly due to the glycosidase activity in O.oeni that results in hydrolysis of the mannoprotein. The release of amino acids and peptides can shorten the lag phase of the bacteria and increase the biomass. Yeast autolysis rates are highly strain- and environment-dependent. 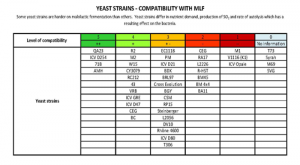 To help the winemaker make decisions on yeast/bacteria compatibility, Table II has been developed by Lallemand (adapted for strains available in the North American market). 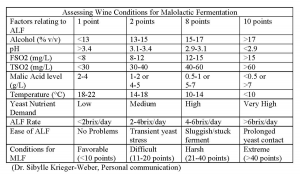 Based on current knowledge, the success of malolactic fermentation is due to the winemaker’s strain choice(s) for alcoholic and malolactic fermentations, environmental conditions, and winemaking practices employed. It is recommended that the malolactic fermentation be planned in conjunction with the alcoholic fermentation in order to maintain wine quality and consistency. 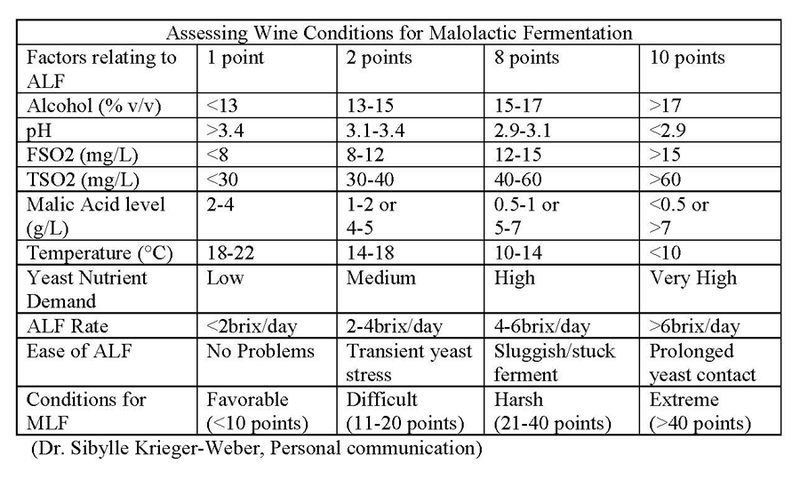 Table III summarizes the many factors that can play a role in the outcome of malolactic fermentation. If your wine shows that favorable or mildly difficult conditions exist, a direct bacteria addition can be used. If the conditions indicate that harsher conditions exist, the best approach would be to try a one-step formulation (final acclimatization conducted in your wine). If extreme conditions are apparent, a standard build-up culture would be recommended. 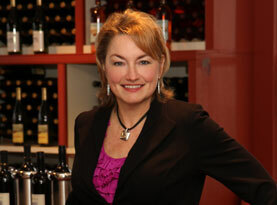 Nichola Hall, Ph.D. is a Technical Representative for Scott Laboratories based in California. See http://www.scottlab.com/ for more information. 1. Alexandre, H., P.J. Costello, F. Remize, J. Guzzo, and M. Guilloux-Benateir. 2004 ‘Saccharomyces cerevisiae-Oenococcus oeni interactions in wine: Current knowledge and perspectives.” Int. J. of Food Microbiology 93: 141-154. 4. Déléris-Bou, M., S. Kreiger-Weber, and G. Specht. 2011 Proceedings: 2nd international wine microbiology symposium. In conjunction with California State University, Fresno. 5. Delteil D. 2004 ‘Yeast/bacteria interactions: Practical aspects in Mediterranean and Rhone red wines.” The Australian & New Zealand Grapegrower & Winemaker February: 58-61.